Every Wednesday between 19:45-22:00 we practice at the Loodpolderweg 2 to Alkmaar. You are welcome to come and watch. We like to give you explanations and answers to your questions. On Saturday, January 19, 2019 the fanfare of Drechterland existed for 100 years. Highland Cathedral was included in their repertoire after we promised to take part. Koos, Peter and Ben started together with eight drummers in a dark sports hall. "In the spotlights" Koos, Peter and Ben with their performance at the fanfare of Drechterland. In 2017 our very valued member Erwin was on holiday in Zeewolde. Coincidentally there was a street musicians festival in the center. Anyone who makes music on the street was warmly invited to make a contribution on a voluntary basis. 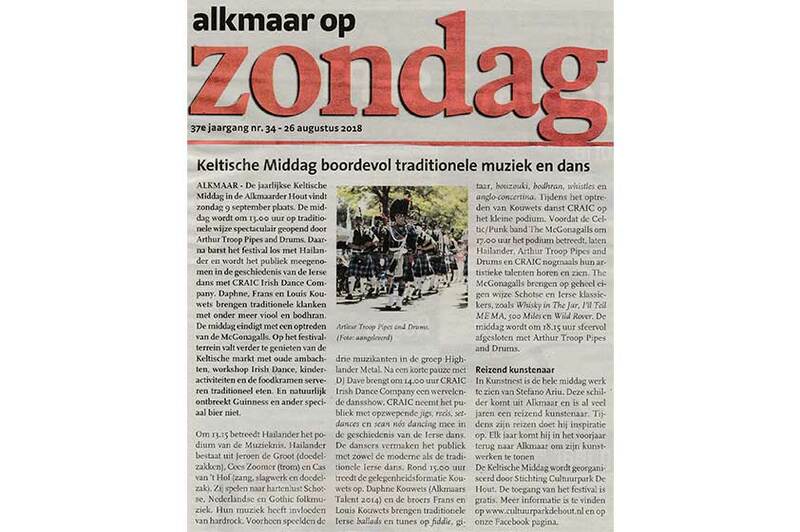 ALKMAAR - The annual Celtic Afternoon in the Alkmaarder Wood takes place on Sunday 9 September. 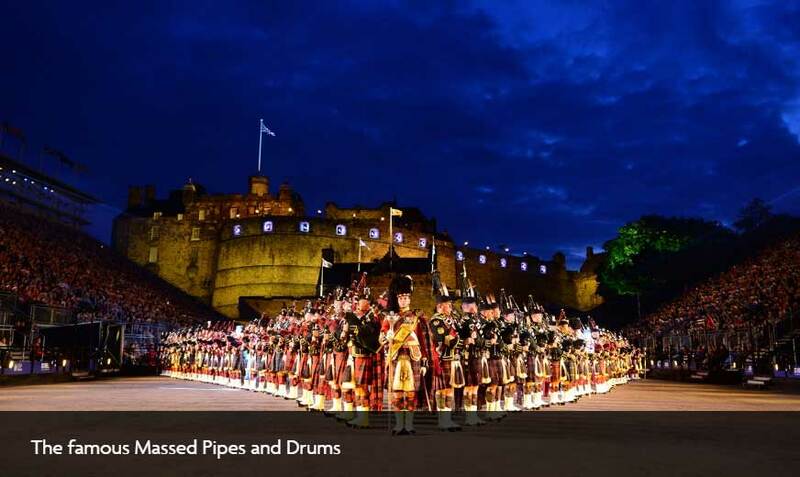 The afternoon opens at 13:00 in a traditional way spectacularly by Arthur Troop Pipes and Drums. Then the festival breaks loose with Hailander and the audience is taken into the history of Irish dance with CRAIC Irish Dance Company. Daphne, Frans and Louis Kouwets bring traditional sounds including violin and bodhran. The afternoon ended with a performance by the McGonagalls. On the festival site you can enjoy the Celtic marlrt with old crafts, workshop Irish-Dance, children's activities and the food stalls serve traditional food. And of course Guinness and other special beer are not missing. Celtic Afternoon full of traditional music and dance. Spectacular opening by Arthur Troop Pipes and Drums. 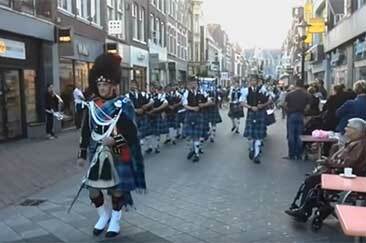 "The Arthur Troop Pipes and Drums" (ATPD) is a pipe band from Alkmaar. The band is named after the founder of the International Police Association (IPA), Arthur Troop. 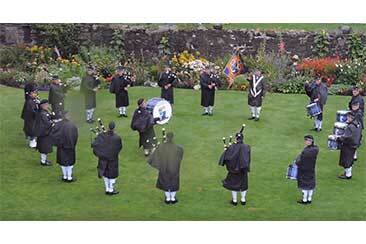 We are the proud bearers of the IPA tartan, which belongs to the IPA section UK, Region nr 1 Scotland. The time has come: the Arthur Troop Pipes and Drums is back online with a complete new website! Our band is celebrating the tenth anniversary 23018 on 22 May. A memorable milestone. 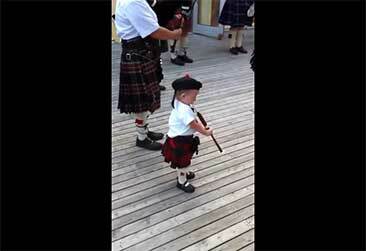 In honor of this anniversary the band in August of this year to Scotland. An "once in a lifetime" experiënce. While many have ever seen them Dismayed Alkmaar. And, above all, heard. 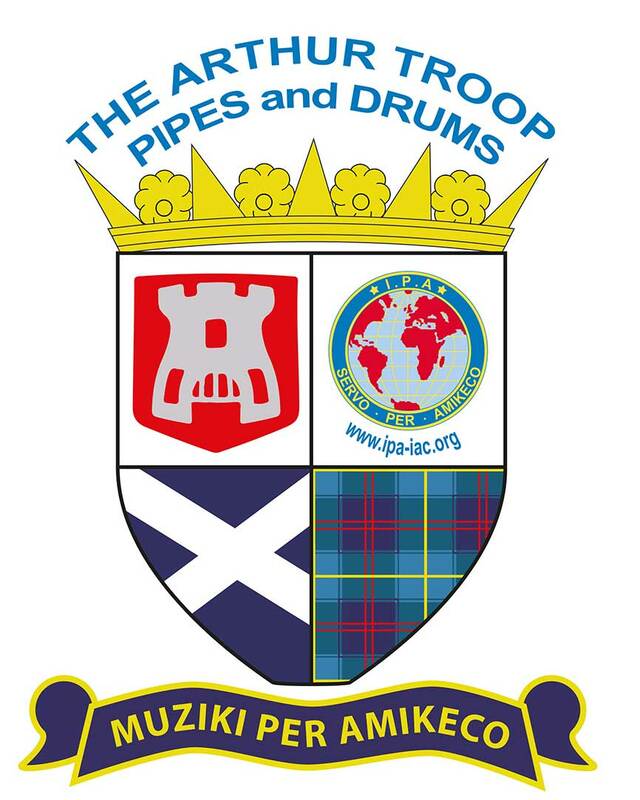 The Arthur Troop Pipes and Drums (ATPD). 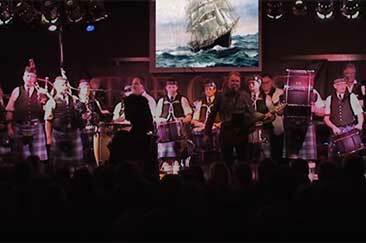 An enthusiastic Alkmaar music company, that specializes in playing traditional Scottish music. "We do this with pleasure and respect. For the music and each other, "said Patrick Witsen, Member of the band. Provide the musicians each year various performances both at home and abroad. ' 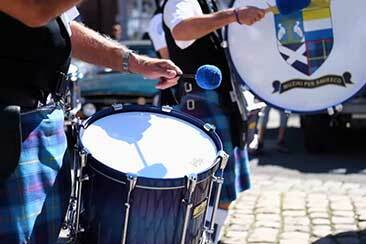 Musicianship by friendship ' is the motto of The ATPD, consisting of bagpipers, tenor, bass and snaredrummers. The ATPD takes its name from the founder of the IPA, the English police officer Arthur Troop. The band celebrates its 10th anniversary next year (2018) with a visit to the country where the roots of the music pieces are: Scotland. To the trip for the 25 members and to pay for pupils, is The Arthur Troop busy on different ways to raise cash. The band in action during one of the performances. 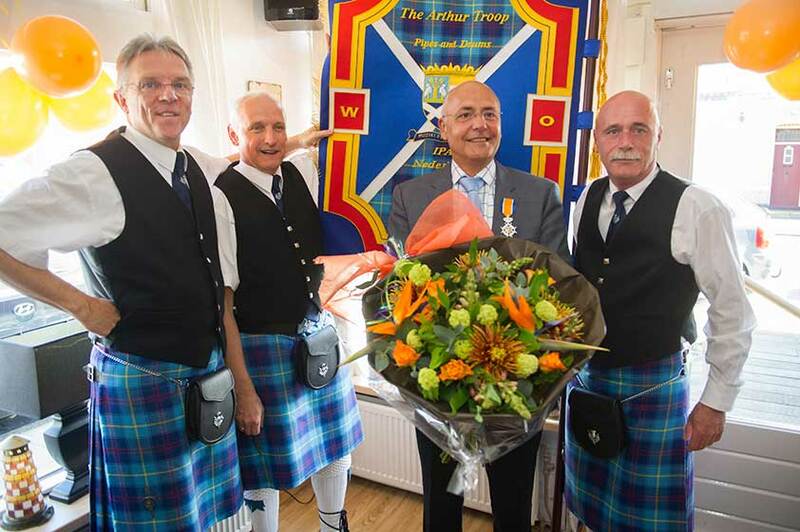 Egmond aan Zee (Bergen)-during the annual "Ribbons Rain" by 2017 is our Patron, Kees Sal, "Knighted in the order of Orange-Nassau." A very special performance, which we do not have let go unnoticed. today, 26 april 2017 was the day of the so-called ribbons rain, it was a great day for our friend K Sal because he has for his service and commitment in the IPA a Ribbon. A thick earned appreciation! 3 prominent members of our band and the pride of Kees were here, all playing at present. Thank you Kees and we hope that we are still long of your commitment and enthusiasm may enjoy! During the reception, of course, we have our "Patron" with flowers surprised. Knight Kees with a delegation from our band. 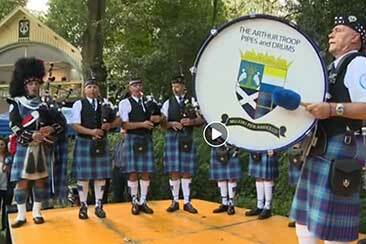 The Arthur Troop Pipes and Drums opens the Celtic afternoon at Cultuurpark De Hout in Alkmaar. 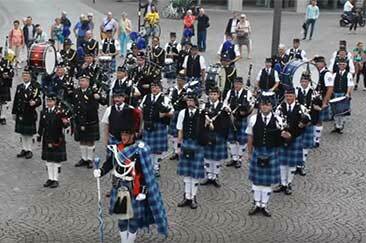 On Saturday, September 8, 2018, the Arthur Troop Pipes and Drums could perform various performances in Stavelot (B) during the British Carmevering. 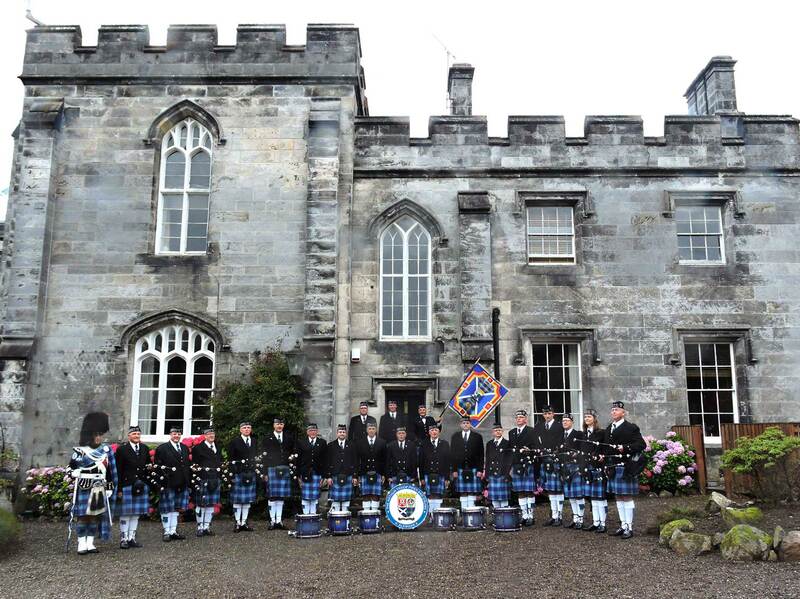 STIRLING -In honor of the 10-year jubilee, the Arthur Troop Pipes and Drums will play under ample interest for half an hour at Striling Castle (Scotland), despite heavy rain showers. 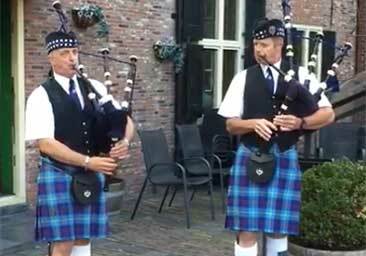 In memory of the victims of a deadly shooting at the Dunblane primary School in Dunblane Scotland composed by Pipe Major Robert Mathieson this number. The grand procession during Alkmaar Ontzet in 2017. 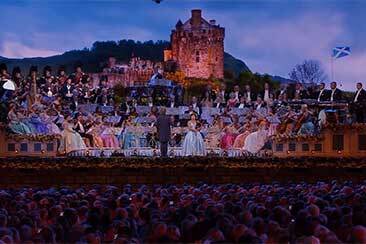 A beautiful rendition of Highland Cathedral by André Rieu and The Johann Strauss Orchestra with the Coriavullum Pipers. The buildup. The forecast. 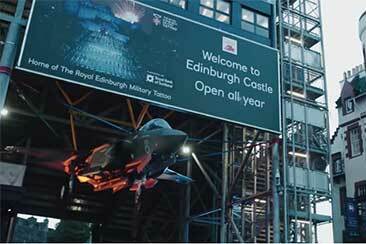 A Royal Edinburgh Military Tattoo. 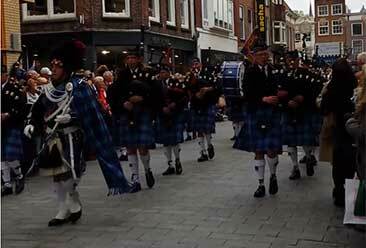 A summary of the activities of the Arthur Troop Pipes & Drums during the 4-days evening walk in Alkmaar. 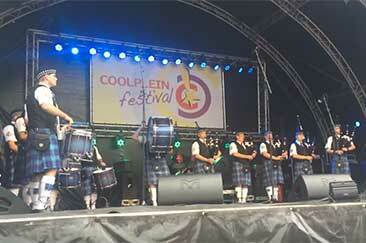 A performance during the Coolpleinfestival, 27-09-2014 in Heerhugowaard. The Drums and Pipes Policeband Maastricht along with the The Arthur Troops Drums and Pipes Alkmaar during Flikkendag Maastricht 2014. Sailing Home. 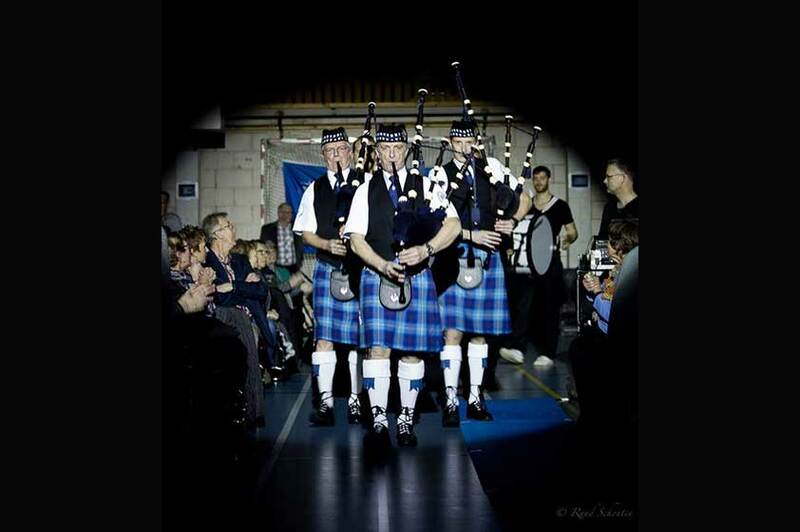 The Cats Aglow together with the Atrhur Troop Pipes and Drums during a performance in Wervershoof on March 7th 2015.